Start out on the Main-Danube-Canal, an engineering marvel connecting east with west. The Main passage introduces you first to Bamberg, whose historic medieval city centre received UNESCO World Heritage Site status in 1993. Marvel at a collection of over 2,400 listed heritage buildings, brought to life by the knowledge of an expert local guide. From here, Würzburg awaits, and you’ll spend the day exploring the Bishops Residenz, one of Europe’s largest Baroque palaces, including an exclusive EmeraldPLUS wine tasting experience. 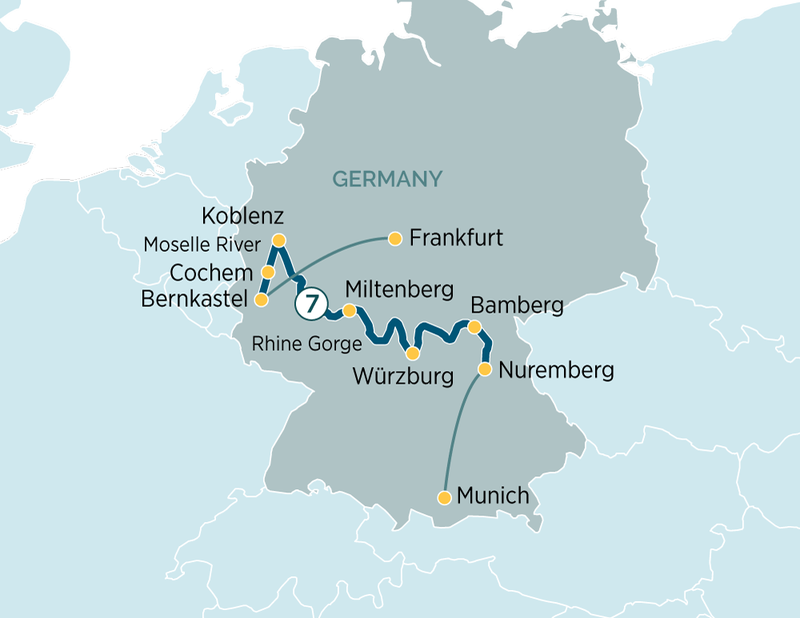 Hike the hillsides of Bavaria as you explore Miltenberg and Wertheim, taking in the incredible Merchant Hall, before travelling on to Koblenz, home to the impressive Ehrenbreitstein Fortress. This afternoon, we sail through the enchanting Rhine Gorge, during which time you’ll enjoy a lecture on the region’s history of viticulture. Entering the Moselle, explore Cochem and its beautiful Reichsburg Castle, and savour the rich historical sites of Bernkastel – the final call on this epic journey through the heart of Germany.